The 20th Annual Christmas Tree Lighting for the Jersey Shore Arts Center, Ocean Grove (former Neptune High School) was held on Mon., Nov. 28 with an audience of over 300 in the Joseph A. Palaia Theater. The program featured the Shoreline Dance Academy Senior Dance group performing the Lord’s Prayer and the junior group dancing to holiday music. The LaStrada Theater Company of the Jersey Shore Arts Center followed with cast members offering their moments of Christmas’ past. LaStrada then read Clement Clarke Moore’s ‘Twas The Night Before Christmas” to the delight of the children and the adults. Next the 40-member Atlantic Wind Ensemble lead by Director Dennis Eschbach and Director Emeritus Harry Eichhorn presented a wonderful selection of holiday and popular music. A reception ended the evening with refreshments provided by the Arts Center Volunteers. The three floors of the building are beautifully decorated for the holiday and the public is encouraged to visit and view the decorations. 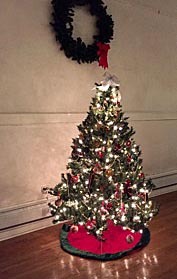 An evening of merriment, good fellowship and holiday spirit was enjoyed by all. The Jersey Shore Arts Center in Ocean Grove has a mission to save and restore their beautiful and historic building (the “old” Neptune High School) that is currently home to the Jersey Shore Arts Center, and to operate the arts center in support of local artists and arts educators. The Jersey Shore Arts Center provides accessible space for artists, and arts related educators and community groups who in turn develop opportunities for the broader Jersey Shore community to experience and engage with the Arts. For more information on the Jersey Shore Arts Center’s programs or history visit www.JerseyShoreArtsCenter.org.